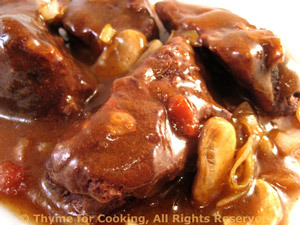 Braised Beef Chianti, Thyme for Cooking Main course. I love doing long-cooking, wine-infused, meat in the cool months. It's a wonderful way to get the most out of 'cheap cuts' and, usually it's the cheap, flavorful cuts that we want. They have the most flavor and get meltingly tender. I always plan for leftovers. Remove any big chunks of fat from beef, cut into large pieces, about 3" (8cm). Put the beef into a bowl just large enough to hold it. Slice the onion, carrot and celery and add to beef. Add the bay leaves, juniper berries and peppercorns. Pour the red wine over, cover and refrigerate at least 12 hours. (24 or 36 is okay). 4 1/2 hours before dinner take the meat out of the marinade and let drain, reserving all of the marinade. Heat oil in the braising pot. Add beef and brown well, about 15 minutes total. Strain the vegetables, reserving marinade. Add vegetables to the beef. Open and drain the tomatoes. Roughly chop the tomatoes and add to beef. Clean mushrooms. Roughly chop and add to beef. Add 1/2 of the reserved marinade, cover, reduce heat and let simmer, gently, for 4 hours. Check it periodically and add more reserved marinade as needed. It should almost cover the beef. I used all but about 1 cup. Remove beef from pan and keep warm. Strain vegetables, reserving wine/pan juices. Skim off any excess fat if you can (use a spoon or fat separator), then put juices in a saucepan. Slowly add cornstarch mixture to thicken. You probably won't need all of it so stop periodically and let it cook to test consistency. Remove bay leaves from vegetables and discard. Add reserved vegetables to saucepan and heat through. Arrange some of the beef on a platter. Spoon some sauce around and serve, extra sauce on the side.